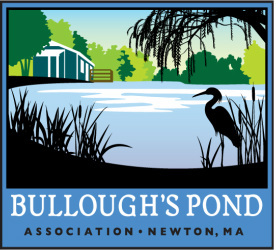 Bullough’s Pond served early settlers and farmers in Newton as the power behind a local grist mill. Later it became a source of ice for iceboxes. For much of the last century, the pond was a wildly popular venue for ice skating. As Newton developed, however, silt and pollutants found their way into the pond, and its condition deteriorated. Twenty-five years ago, Bullough’s Pond was an urban eyesore, a muddy, silted, untended marsh surrounded by chain link fences. Thanks to the efforts of Betsy Leitch and the organization she founded, the Bullough’s Pond Association, our community found the will – and the money – to save one of the loveliest settings in the Garden City. There is work to do around the pond. A forest of invasive trees and shrubs has blighted parts of the shoreline. Unwanted aquatic plants threaten the water’s quality. Silt and pollutants still drain into the pond, shrinking its size and lessening its purity. The pond’s historic skating hut is falling down. It needs to be preserved and re-purposed, perhaps as an observation platform or nature center. These plans, and the routine maintenance of the pond’s shores and pathways, cost money. Our Association works with the city and state, raises thousands of dollars, and devotes countless hours every year, to keep the pond beautiful. Please help us to protect this wondrous waterscape.